« What’s Your Irrepressible Joy? Hi lovelies! I thought i should show you where we’re at with our bathroom since its the room (besides the kitchen) where we’ve seen the most amount of progreess. We seem to be in a bit of a ‘hurry up and wait’ space – i’ve been going to the house every day or so and it feels like everything is the same – all a bit tricky since we move in tomorrow! We’ve had a bit of a disaster with our outside paving – so our outside areas are a bit of a sandpit, aaargh! Anyway…let’s get back to our bathroom. 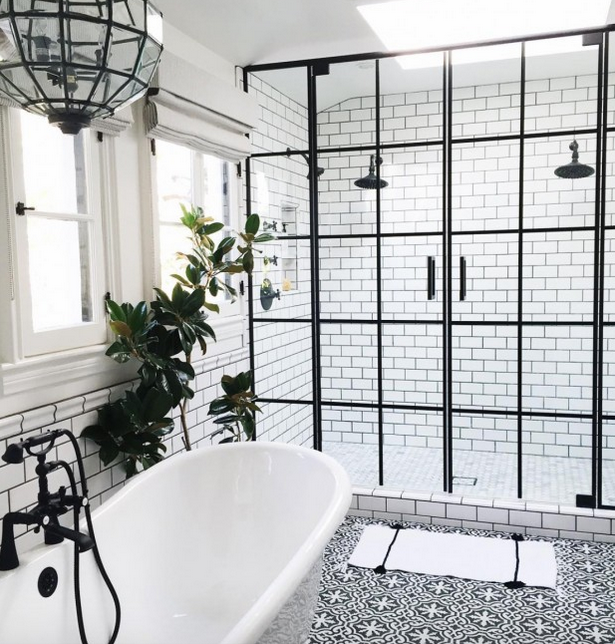 Now, if you follow interiors mags and insta feeds and if you’re in the market for some homemaking yourself, you’ll know that beautifully decorated bathrooms are the biggest thing in interiors right now. 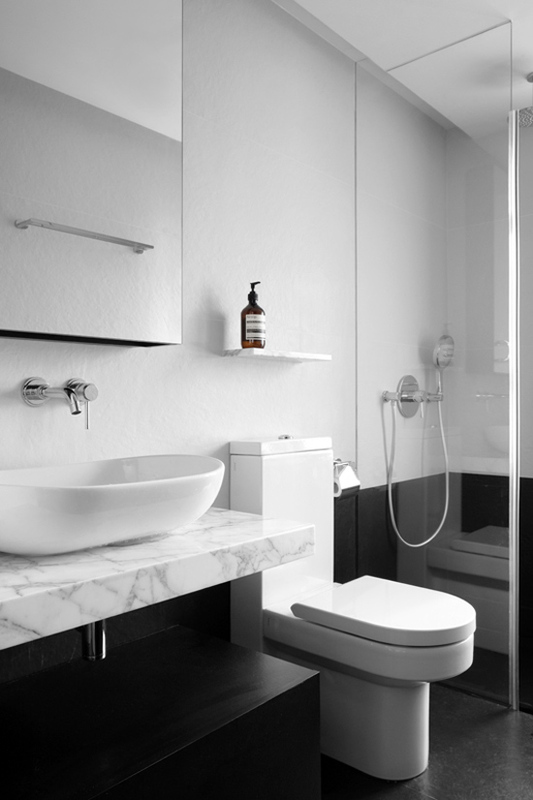 A few years ago the bedroom was it – but now, the bathroom has joined it as a partner in crime! As a Mom to two young children, i can only say that i LOVE my bathroom time when i am alone and that if The Captain draws me a bath without me asking him, i am a blithering wreck of gratitude. Now that there’s a drought, i haven’t had a bath in months and the children bath together in shallow little baths, but before Ava was born, Charley joined us for a family bath virtually every night. Right now baths are a luxury we’re not likely to experience for a while or until the drought is over, so with that in mind, we went all out in our shower for our new bathroom. 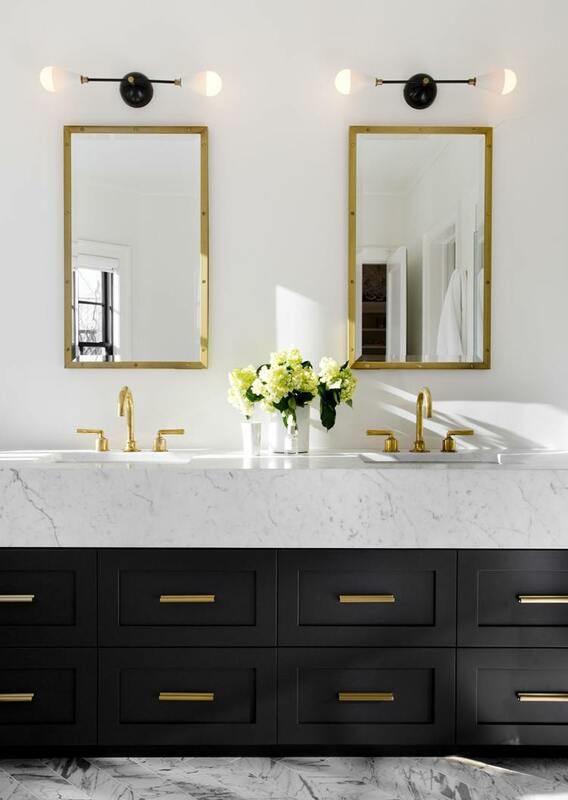 I knew i wanted some black and i KNEW i wanted some marble in our bathroom. Originally i was all about the marble countertop. 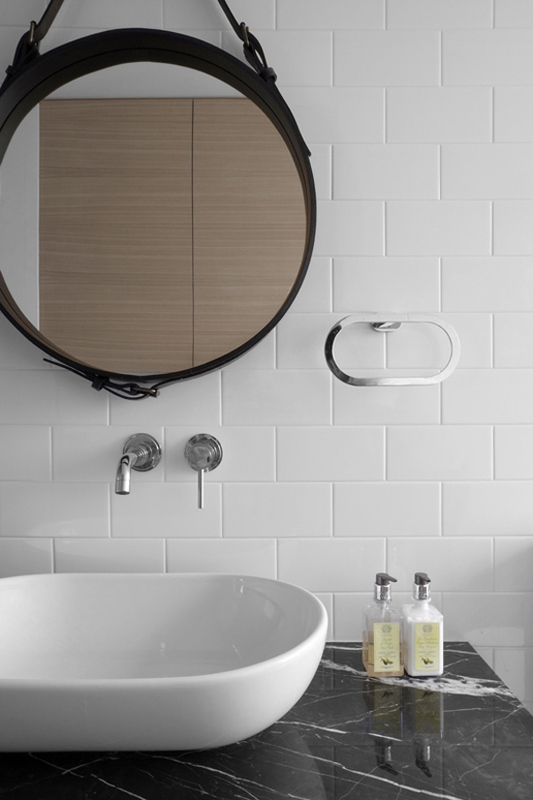 A round mirror is a must for me in our new bathroom – i’ve found a lovely one and will share it in our reveal. I had my heart set on brass taps and mixers but we eventually went for stainless steel – i’m still a little depressed about it but i’ll get over it. I couldn’t find any contemporary brass fittings i liked and that were in our price range. I’m going to bring in some brass with the vanity though. 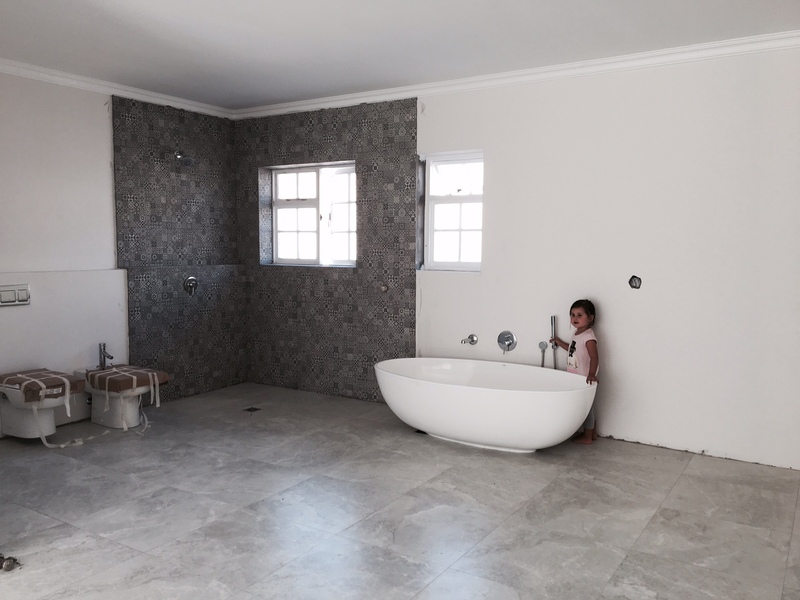 • Marble surfaces – i really wanted marble counters but then, after WOMAG came on board as a partner for our renovation, we went to their showroom and i spotted their marble floor and wall tiles and that was that – sold! Also…Womag has a HUGE sale at the moment – as in 25% off loads of their tiles! 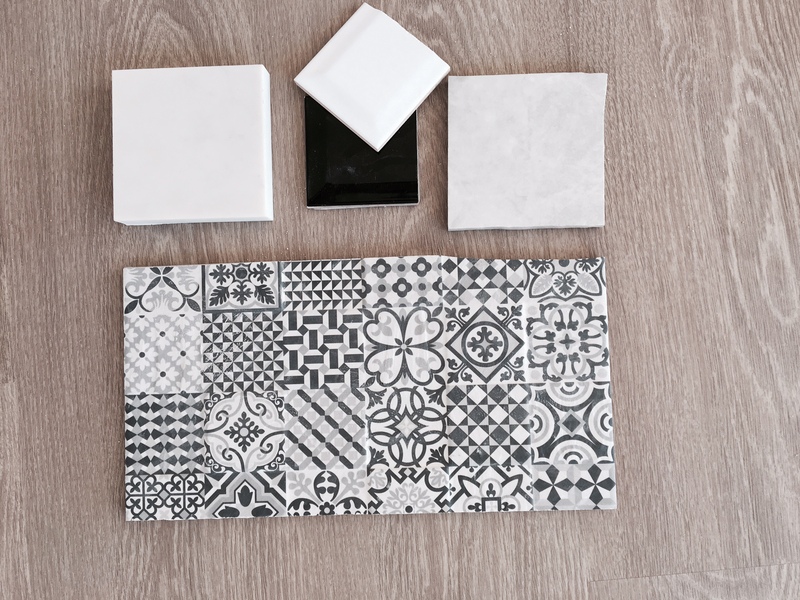 • Moroccan tiles – i wasn’t sure where but i knew we wanted them!! I had featured the Deco Heritage tiles in black before on the blog, it was just a matter of finding a spot for them in the bathroom. Originally they were going to feature in a floor to ceiling panel behind the bath but then we decided to use them in the wetroom part of the bathroom. It’s a double shower setup and i LOVE it – also they are an affordable way to make a really big statement. 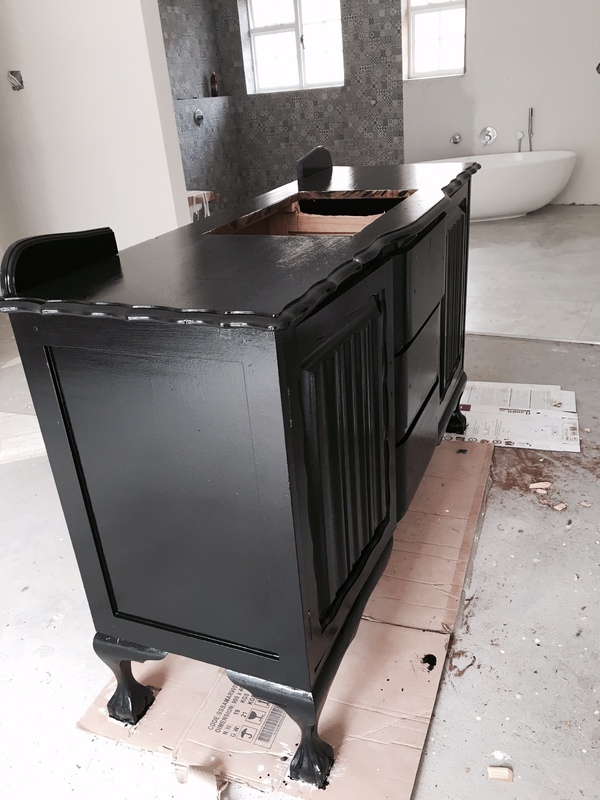 Our tiler did a great job – despite The Captain making him repeat the work three times to get it perfect. His pernicketyness has paid off – it looks amazing! This was a week ago during the process when the tiler had to redo the placement of the mosaic style tiles. The dark paint is the waterproofing – can you see we took the tiles off the panel where the second window is? That was me – you can imagine how impressed The Captain was when i told him they had to move! Lining up tiles like this can be tricky and there was some toing and froing of placement but The Captain’s perfectionism paid off! 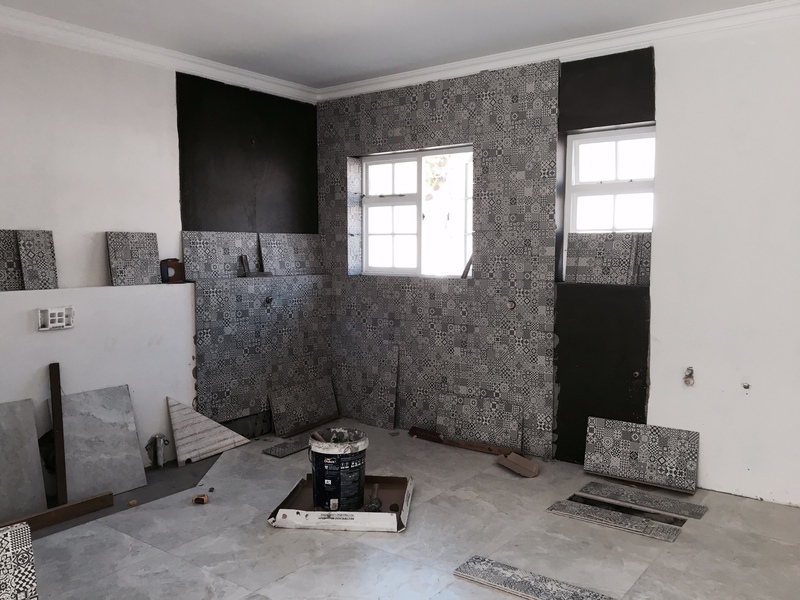 This is how its looking now – just LOOK at those marble tiles from WOMAG? Good grief, I LOVE them!! And the mosaic Deco Heritage tiles look so fab too. For the shower/wet room part of the bathroom – there will be two showers. We have this at home and it’s great! I put an alert on Gumtree looking for an Imbuia dresser and a few popped up in Cape Town but they were so expensive. Luckily, i spotted one in Kempton Park and managed to knock the price down a little – i used the difference in price to pay for a freight company to transport it here – score! It was in perfect nick, complete with keys still in locks and beautiful baize linving the top drawer. • Win the lottery – see above! So, my lovelies, that’s where we’re at! I am thrilled to be partnering with WOMAG for our bathroom, it’s been such a pleasure working with them and knowing that you can get quality like this at really competitive prices is such a good feeling. I did comparitive costings for virtually every product we’ve used in our bathroom and kitchen and they came in the same and/or cheaper than other suppliers which i’m thrilled about since they are the best of the best. Yay! Also…that 25% sale that’s on is perfect timing! I feel like I can live in this bathroom. You make magic of spaces, Vicki!! Looking fabulous already! 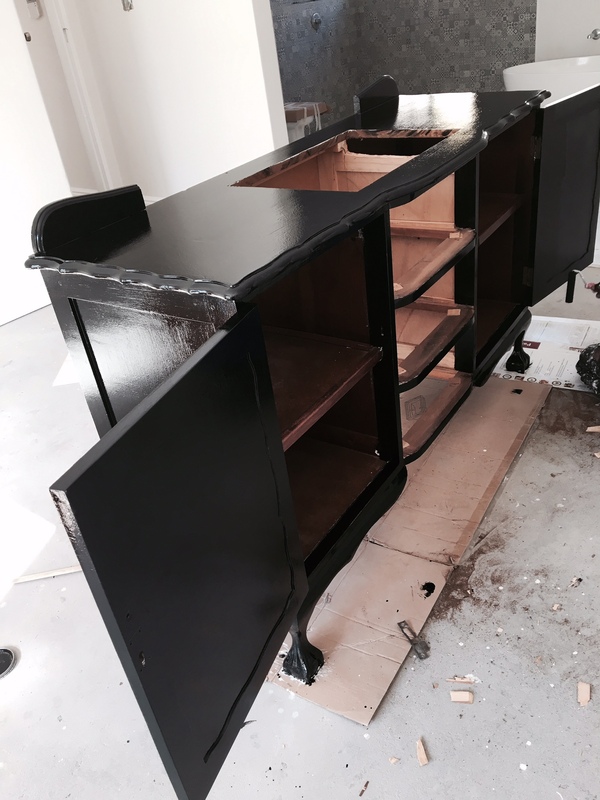 So enjoying these renovation updates, thanks again for sharing! Please can you tell me what laminate or vinyl flooring is in the photo under your bathroom tile samples? Hi Sue, the flooring is vinyl plank flooring – it’s a stick down product (a new age linoleum, really) and I’m thrilled with it. 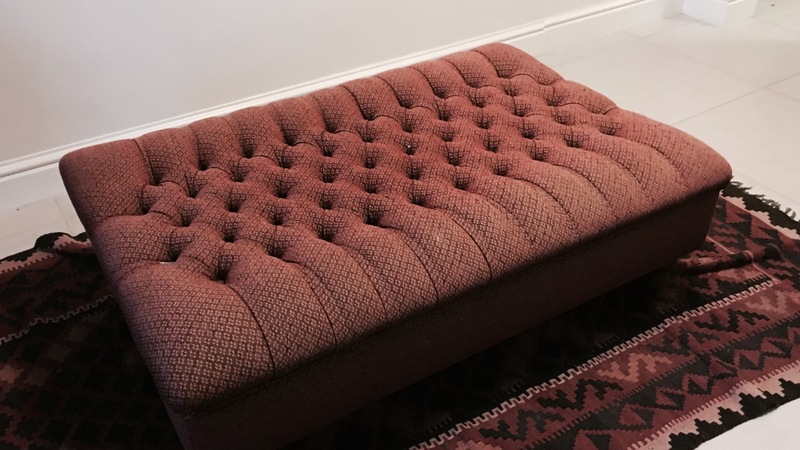 Its really hardy and feels great underfoot. Also, unlike the clip lock laminates, you can use it in bathrooms and kitchens.